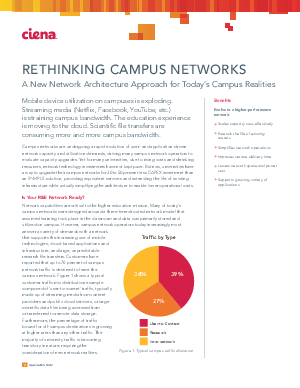 Campus networks are undergoing a rapid evolution of user- and application-driven network capacity and utilization demands, driving many campus network operators to evaluate capacity upgrades. Yet for many universities, due to rising costs and shrinking resources, network technology investments have not kept pace. But now, universities have a way to upgrade their campus networks for 30 to 50 percent less CAPEX investment than an IP/MPLS solution, providing equivalent services and extending the life of existing infrastructure while actually simplifying the architecture to enable lower operational costs.